In September 1943, given the utter administrative chaos and the fact that the Germans had begun rounding up men either to send to Germany or to use in the building of fortifications in Italy, it became imperative to create structures which impeded the indiscriminate exploitation of the workforce on the part of the Wehrmacht. The idea of setting up an Italian organisation with the scope of supplying manpower to the German Armed Forces was proposed by General Francesco Paladino of the Engineers, who put forward his plan to Marshal Graziani, the Minister of Defence of the Social Republic, on 1 October 1943. Two days afterwards on 3 October Paladino met the German authorities at the Albergo Quirinale in Rome to put forward his idea, remaining in close contact with Graziani with whom he had agreed every move. On 6 October Paladino met Zimmerman, and they reached an agreement on a variety of matters, such as the workers' pay, food, lodgings and equipment. The wages were fixed at 12,50 lire net a day, with an additional 20 lire for a wife, 5 for a child and 10 for every dependent parent. Equipment and food were to be provided by the Italians themselves wherever possible, “otherwise they were to be supplied by the Germans”.2 In order to control the tens of thousands of workers there were to be 600 non-commissioned officers and lieutenants, 200 captains and 67 majors. The Inspectorate was to be divided into 15 provincial sections (commanded by 15 colonels or majors) each with 15 officers with differing responsibilities, 15 medical officers, 15 administrative officers and 15 interpreters3, hence a very streamlined organisation, almost skeletal, would manage what was predicted to be a workforce which would number several tens of thousands. This decision had evidently been taken without consulting the other Italian ministries which, up to the time of the armistice, had been responsible for the mobilisation of civilians, in particular the Ministry of Corporations. 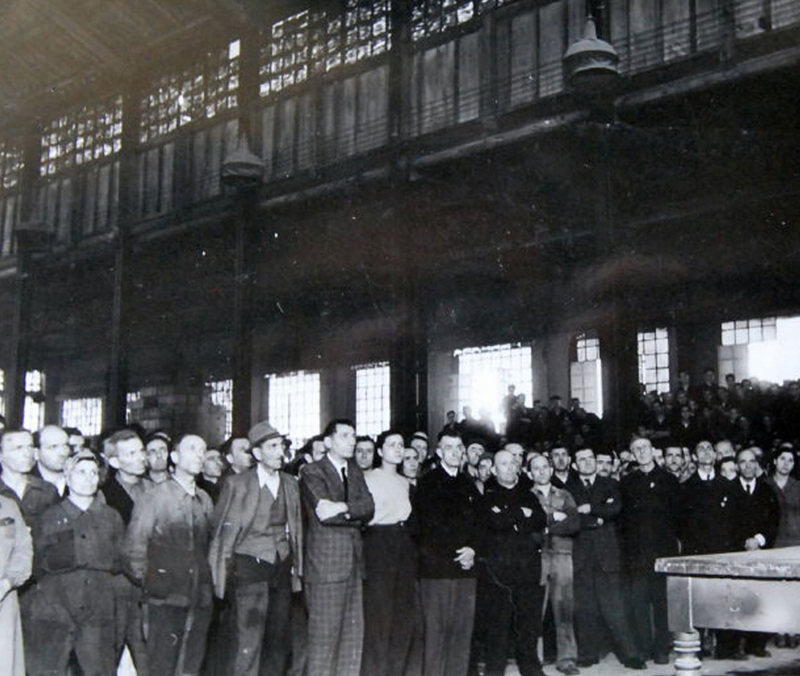 In the early days this series of announcements had generated a great amount of confusion and and a climate of uncertainty amongst the Italian workerforce who, evidently fearing deportation to Germany, were of the opinion that showing up at the recruitment offices, whether they be military or civil, was an extremely risky business. On 12 October Paladino had a meeting with three civil servants from the Ministry of Corporate Economics in order to “eliminate a number of specific setbacks in the enrolment of workers.”11 In this meeting it was decided that in every town hall and provincial government office three types of recruitment centre should be set up: one for the Todt, one for the Paladino and one for workers to be sent directly to Germany (Sauckel Organisation). The meeting closed with a compromise. It was confirmed that the recruitment would be directly controlled by the Ministry of Defence, but the executive body would be the offices of the Ministry. On the same day, 12 October, Paladino sent a circular to the provincial Labour Inspectors with the “primary instructions”. In this circular the General invited them to use tact when dealing with prefects and associated German officials, incited them to overcome the diffidence of the workers, and above all asked them to obtain from the German authorities lists of those workers aged between 18 and 33 years who had already been recruited. Finally he asked for the workers to be treated in the best possible manner, most importantly at the moment in which they arrived in the recruitment centres13. In the same period Paladino sent out another circular which gave general instructions as to how the workers should be organised. Briefly, the base unit was the “Centuria”, made up of one hundred workers under a subaltern. Three of these units made up a company, under a captain, and three companies a battalion, under a higher-ranking officer.14 Therefore in practical terms a battalion would consist of 900 men, with nine subalterns, three captains, and either a colonel or major alongside another official with special responsibilities. To stimulate the Provincial Inspectors into action a reward of 10,000 lire was envisaged for those who had managed to recruit 8,000 men by the end of October. Diario storico della Organizzazione Paladino, 1 ottobre 1943. Diario storico della Organizzazione Paladino, 6 ottobre 1943. Archivio Centrale dello Stato, Presidenza del consiglio dei ministri RSI, b.84bis. 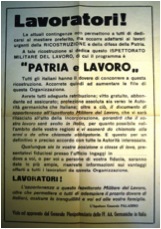 “Il Lavoro fascista”, 9-10 ottobre 1943. Diario storico della Organizzazione Paladino, 12 ottobre 1943. 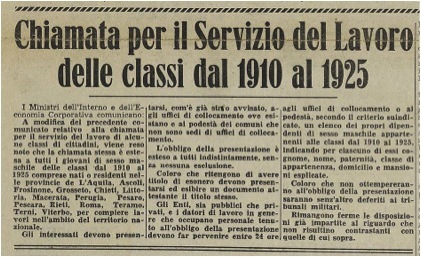 Diario storico della Organizzazione Paladino, 12 ottobre 1943, p.3.